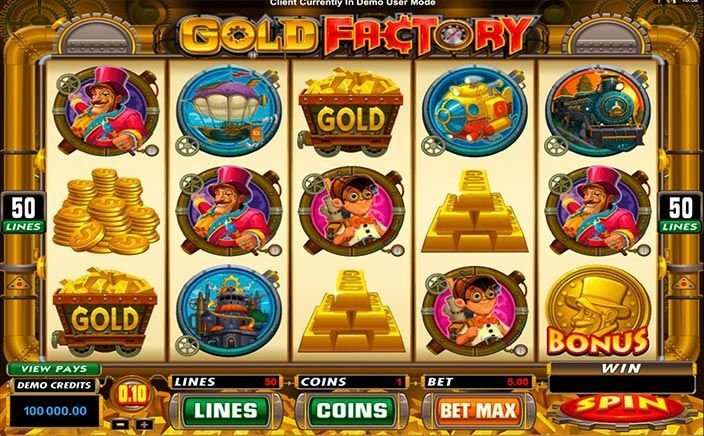 With Gold Factory, you have an online slot by Microgaming with a mixture of genres. It features a mining theme and offers players with a glimpse into high class – luxurious living. 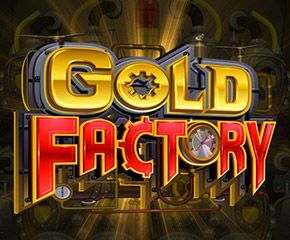 There are three bonus features that players can expect from this online slot and they include: The Gold Factory Bonus, Free Spins Bonus and Boiler Room Bonus feature. You can learn more about these features from the review below. The slots have 5 reels and a total of 50 active paylines. The graphic design of this game reminds players of the golden age of industries. This Victorian styled slot has theme-related symbols these include cute inventions from that period such as a submarine, a train and a hot air balloon. You also have some individuals, products made from gold and a factory. For the Wild icon, you have the Gold Factory Logo which replaces other symbols other than a Large Gold Bonus coin. This bonus symbol will activate the game’s main feature. You can activate the game’s bonus features when you are able to land at least three Large Gold Bonus coin icons in view on the reels. The first bonus feature you should know about is the ‘Boiler Room Bonus’. Players are taken to the boiler room of a factory and they will be required to select four positions from a possible twelve positions in the boiler. Prizes will be unveiled for your choice or the other bonus features will pop up and you will have to play any of them immediately. As soon as you have finished playing either of the Free Spins and Reactor Bonus features, you will be taken back to conclude the Boiler Room Bonus. Whenever the Free Spins Bonus feature pops up you will be given between 10 and 35 free spins. The free spins bonus feature comes up while you are in the Boiler Room Bonus round. As mentioned earlier, you will be taken back to the Boiler Room Bonus round after playing the free spins session in Gold Factory. There is also a Reactor Bonus feature that also comes up while you are playing the Boiler Room Bonus round. Here players are expected to select parts of a reactor that is lit up. As you pick the part you end up selecting prizes, you will keep on picking parts until you are able to pick one out of two parts of the reactor that has malfunctioned. Gold Factory has very detailed graphics and an equally intriguing music score. The bonus features are a real thrill and players can move from one to the other from within the main bonus feature (the Boiler Room Bonus).